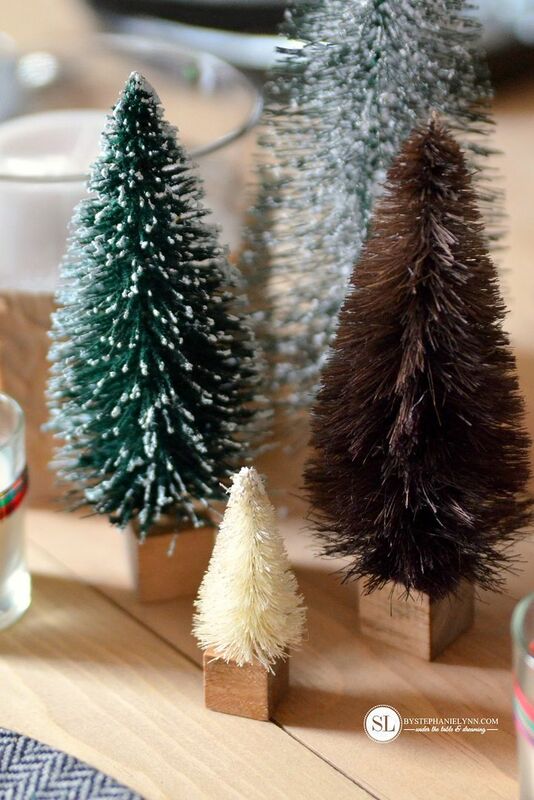 It’s really hard resisting the urge to purchase new holiday decor this time of year. Even though I have several containers packed full of decorations, I still catch myself browsing the seasonal aisles in hopes of finding something different and exciting. As much as I love refreshing my home with brand new items, it can be tough justifying those purchases with so many items in storage. 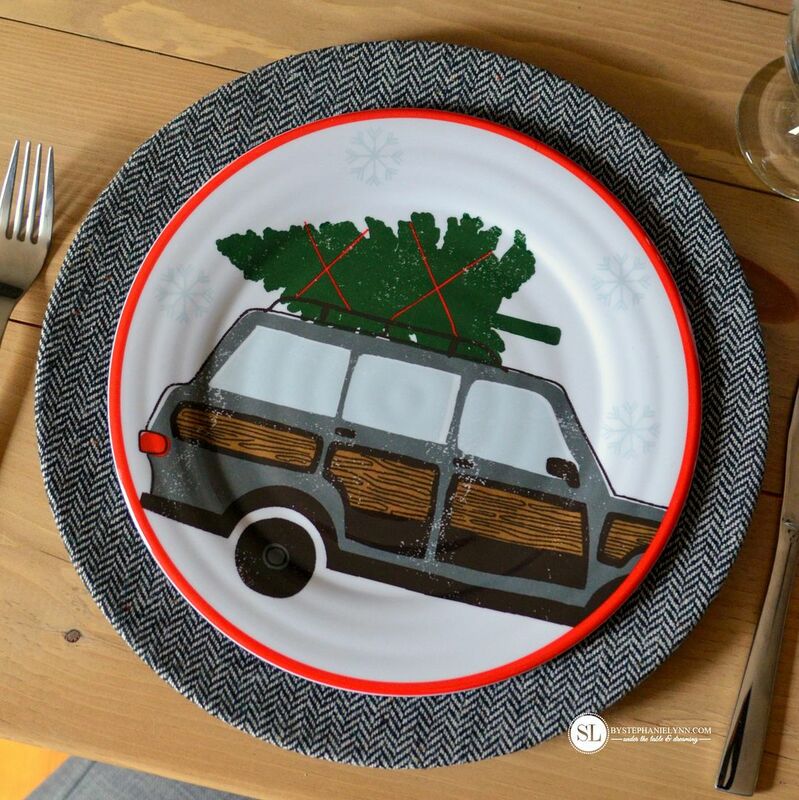 This month Michaels challenged the Michaels Makers blogging team to come up with some fun and creative solutions to five common holiday obstacles – including putting that old decor to good use. 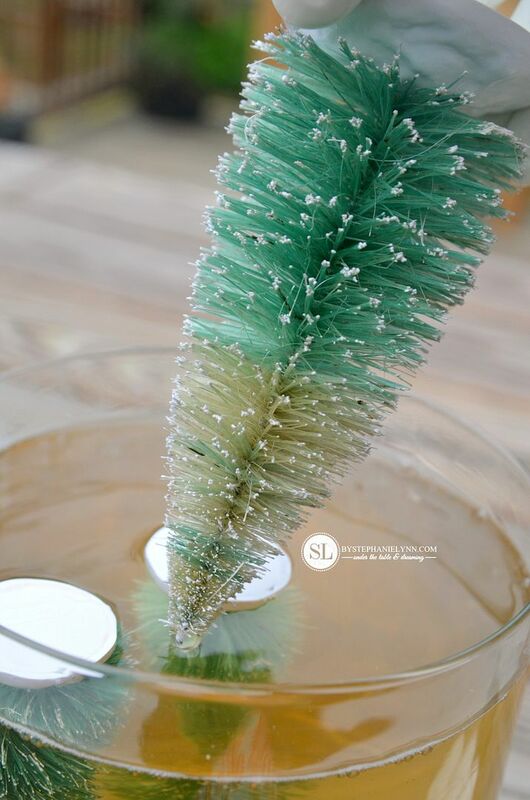 Today’s post is dedicated to three easy and affordable ideas to revive some decor items, you may already have stashed away, for the upcoming holiday season. 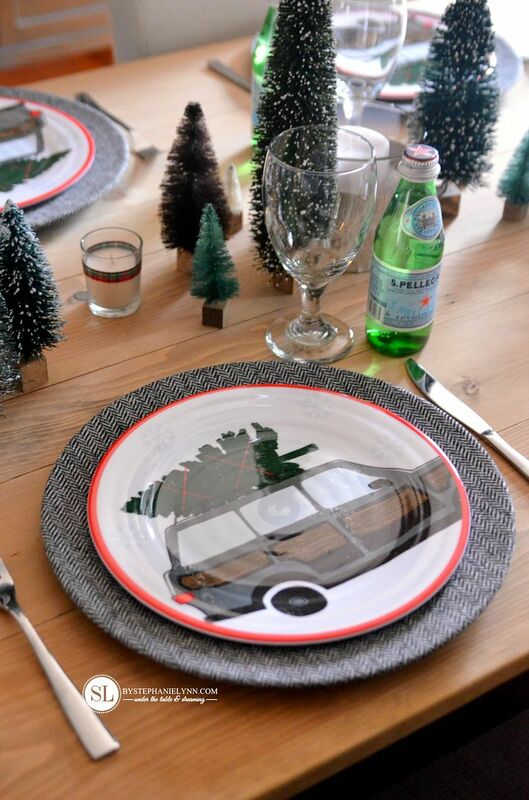 I thought it would be the perfect opportunity to get a jump start on our Christmas morning breakfast table. Although these concepts are geared towards the holidays, two of the three ideas below can be used any time of the year. 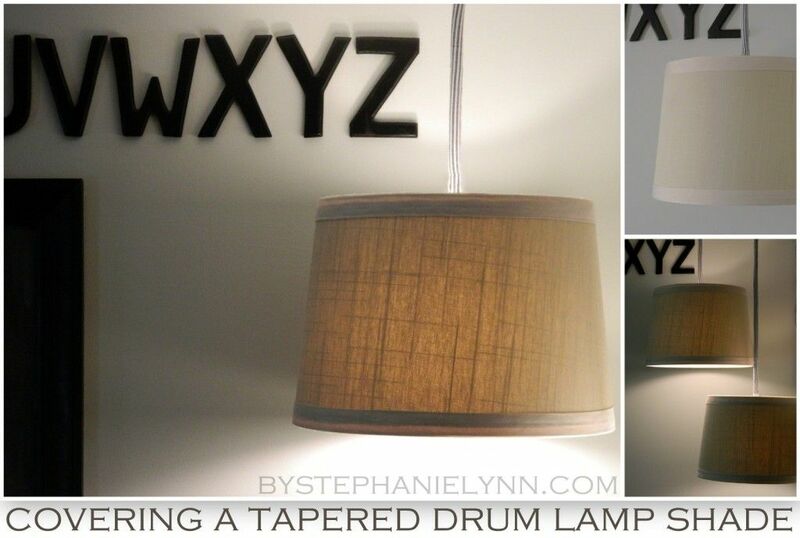 Step One: Turn the charger upside and trace on a piece of fabric. Step Two: Using the outline as a guide, cut the fabric with an additional one inch allowance around the circumference. For reference: One and a half yards of fabric was more than enough to cover eight chargers. 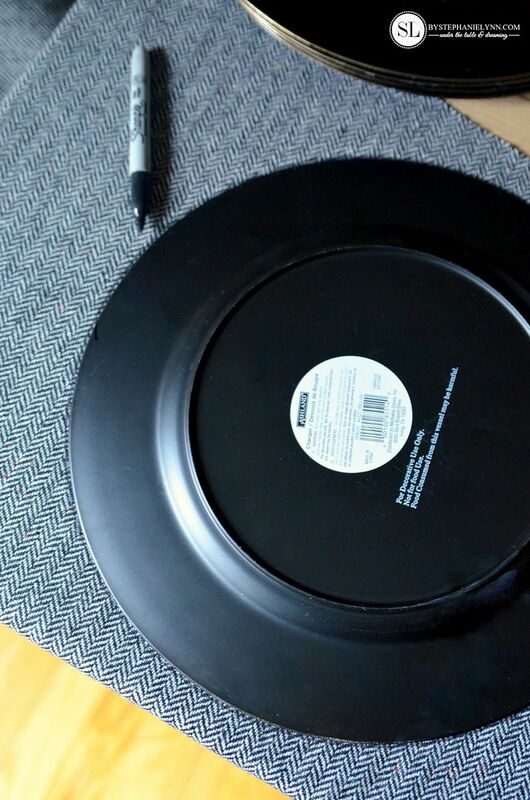 Step Three: Generously spray the front of the charger with spray adhesive. We used Loctite Multi-purpose Spray Adhesive. This spray is repositionable and dries permanent. Note: Follow the brand specific directions for the spray. 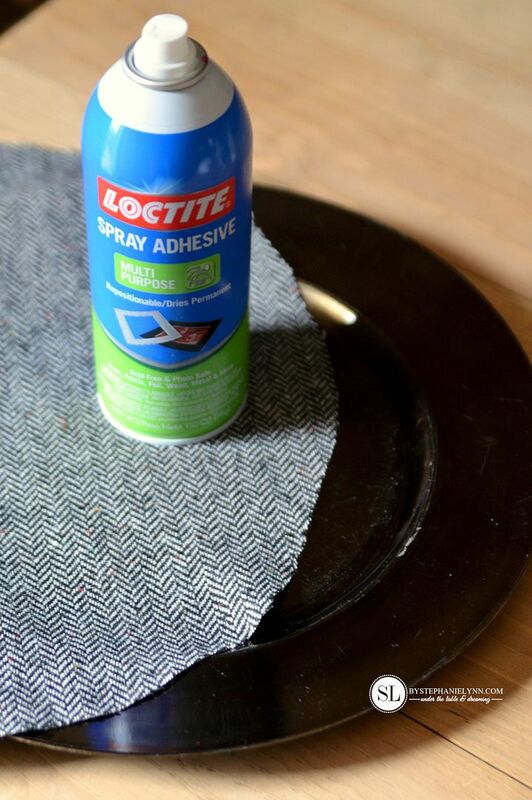 The Loctite adhesive requires you to wait one minute after spraying to join. 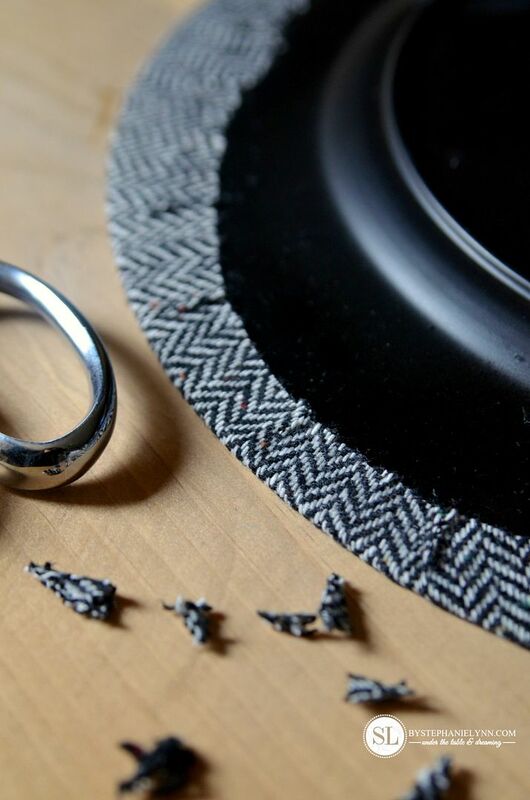 Step Four: Position the fabric on the charger and firmly smooth into place. 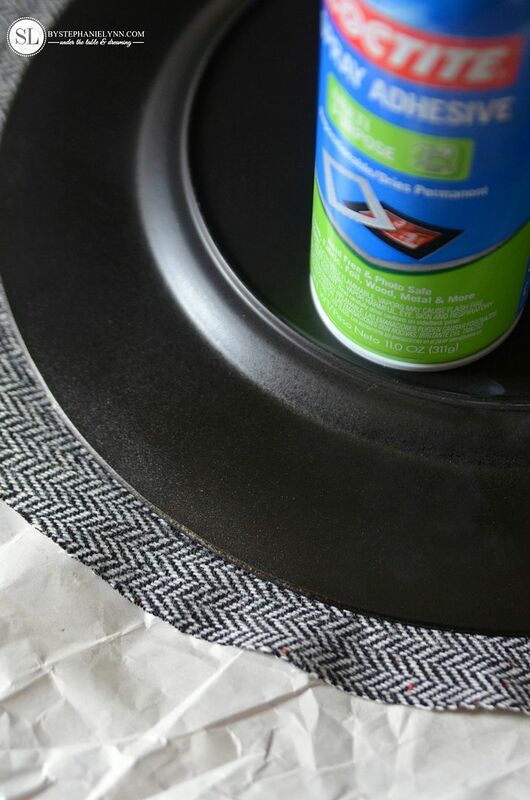 Step Five: Turn the charger over, and spray the outer edge and exposed fabric with a generous coat of adhesive. Step Six: Fold over the fabric and press firmly to bond. 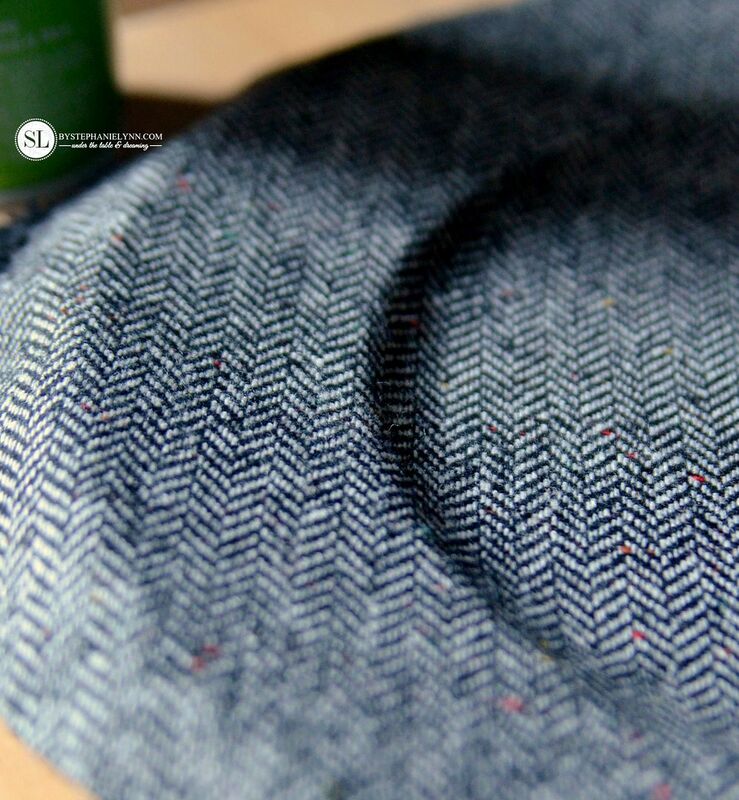 For durability, Mod Podge Hard Coat can be used as a top coat to seal the fabric. 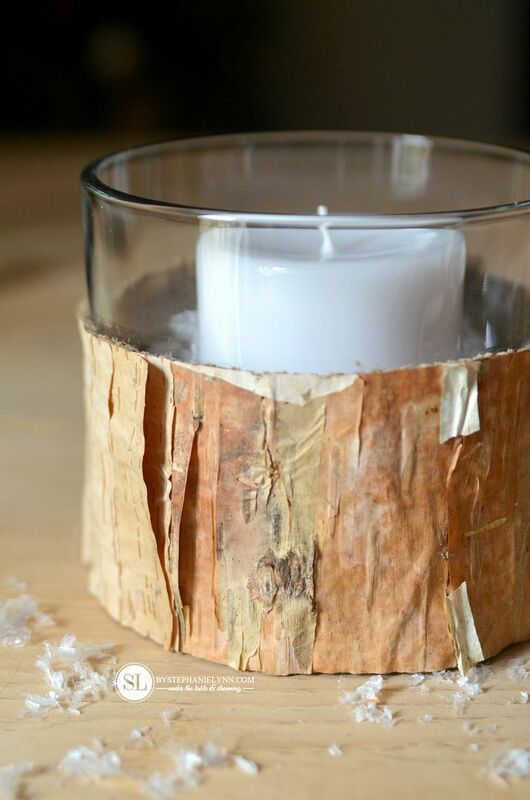 Step One: Cut the Birch Bark Roll to fit the circumference of the glass vase. 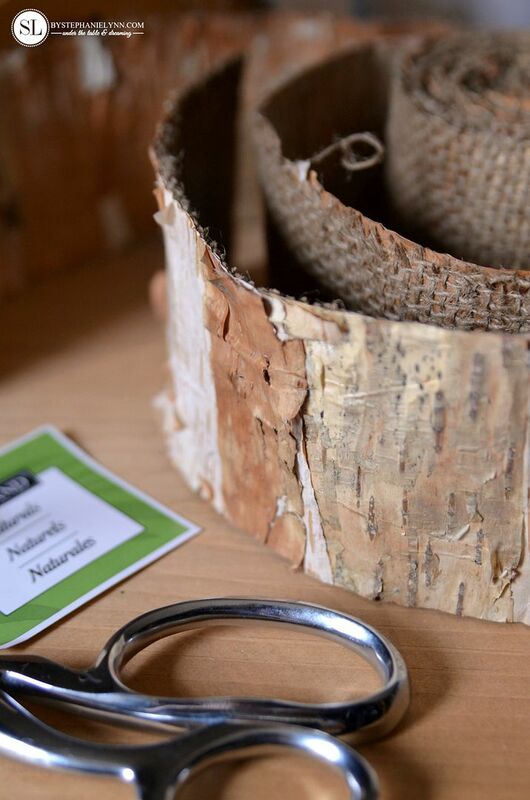 The Birch Bark Roll can be found in the Natural Floral section of Michaels, in-store. 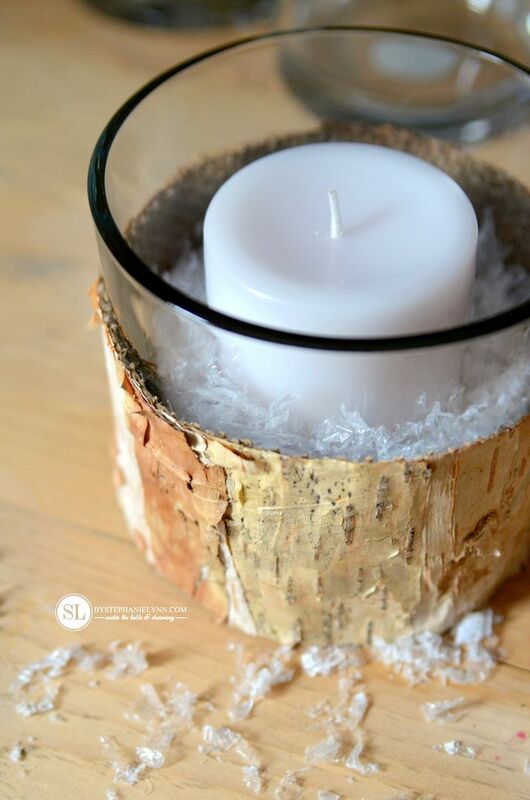 Step Two: Hot glue the birch roll onto the glass vase. 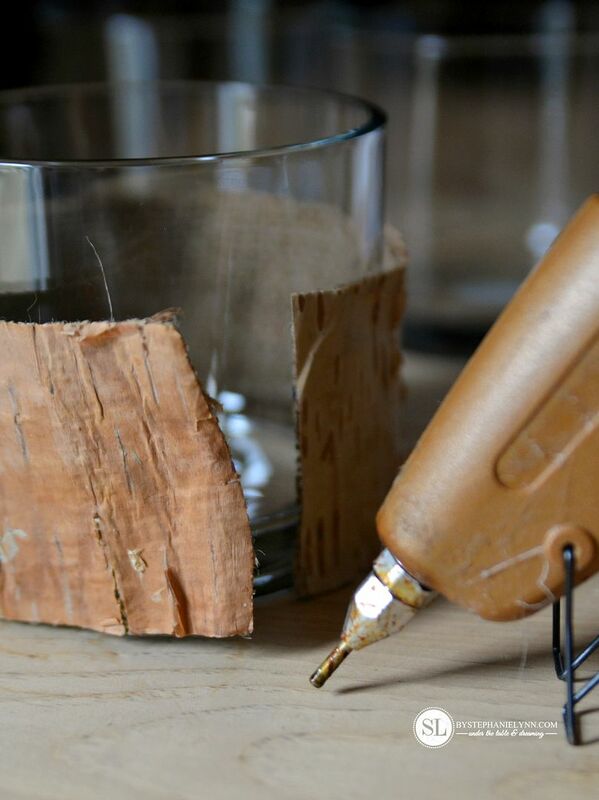 The hot glue can easily be removed from the glass when you are ready to change the design or repurpose the vase. 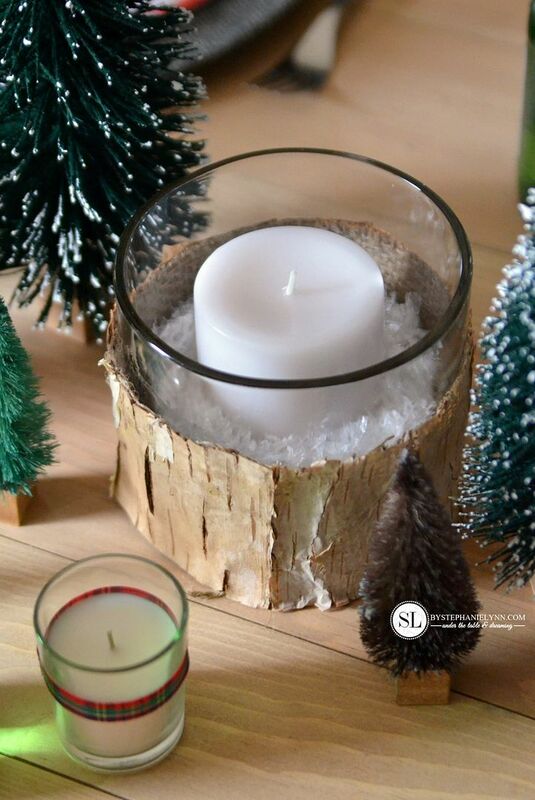 Step Three: Fill the vase with a filler of choice and add a pillar candle. 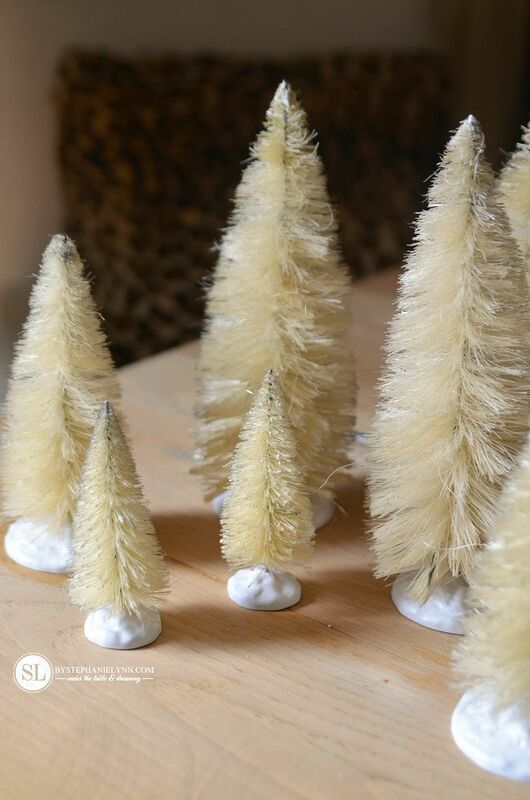 I absolutely adore these little bottle brush trees and just love the way they turned out. Although the step by step process is a ‘heavy’ hands-on project the results are quite drastic and well worth it. 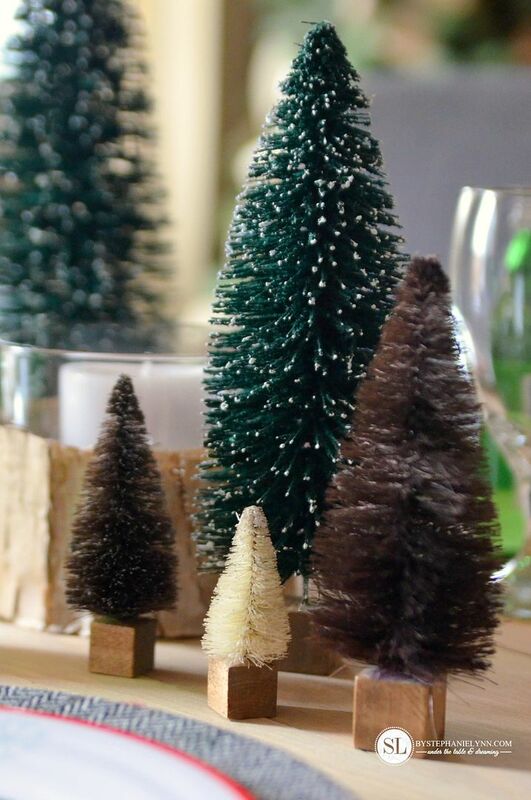 For our tablescape we kept the trees a little toned down – though you can really get creative and colorful with the dying possibilities. Since the steps are a little labor intensive, the detailed, step by step directions will be published in a separate post Wednesday Evening. 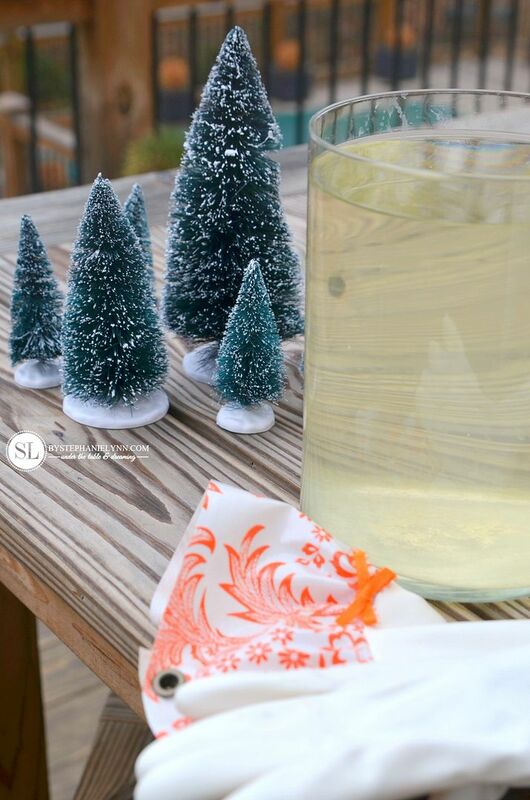 Note: I tried this process with a couple of different bottle brush trees I had on hand and it does not work with all of them. 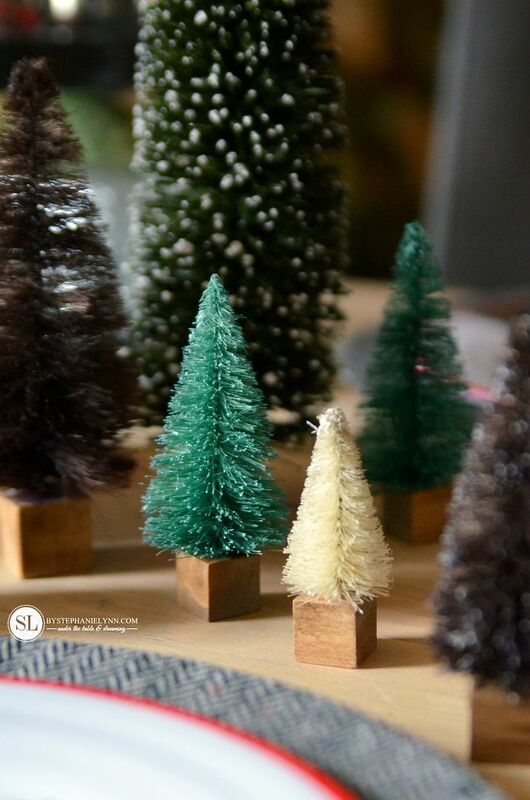 The best results were achieved with these specific trees , available at Michaels in-store and online here . The bases were also replaced with wooden blocks – detailed in the step by step tutorial. This post is brought to you by Michaels . The opinions read here are entirely my own. 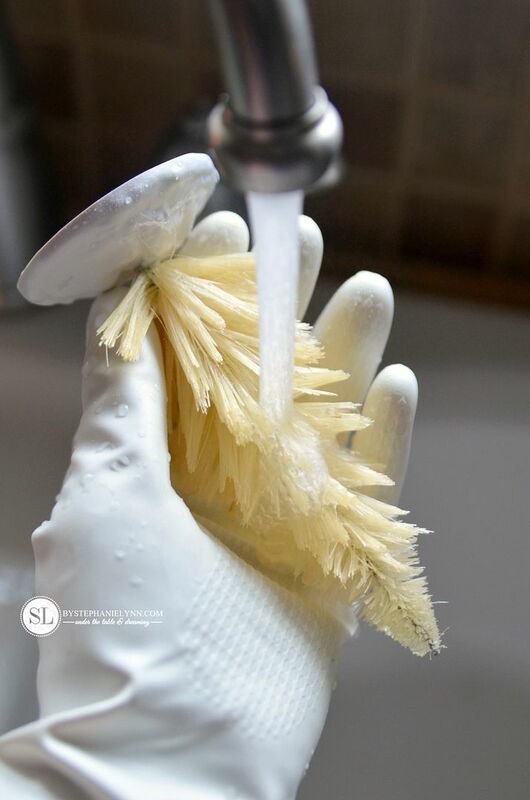 We all have stressors during the holidays and this month the Michaels Makers were asked to come up with creative and fun holiday hacks and tips to help relieve some of that stress and make holiday entertaining and prepping fun! 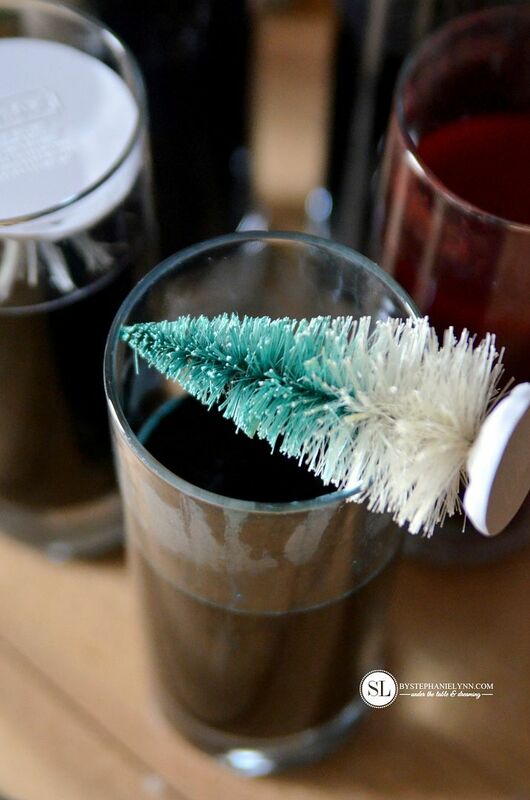 Check out the other four holiday hack topics and the unique ideas all of the makers came up with on Michaels’ blog, The Glue String. 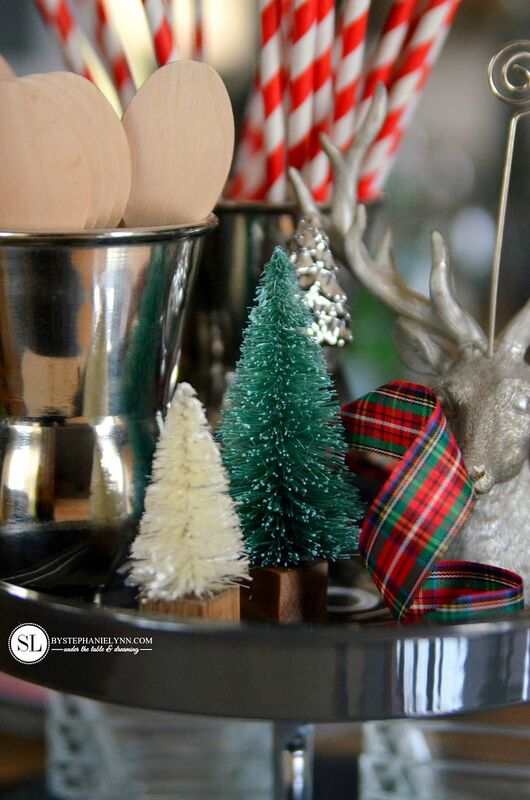 For more inspiration, check out more of Michaels’ holiday project ideas and instructions – including gift wrapping, home décor, last minute gift ideas, hostess gifts and more. Happy Crafting! 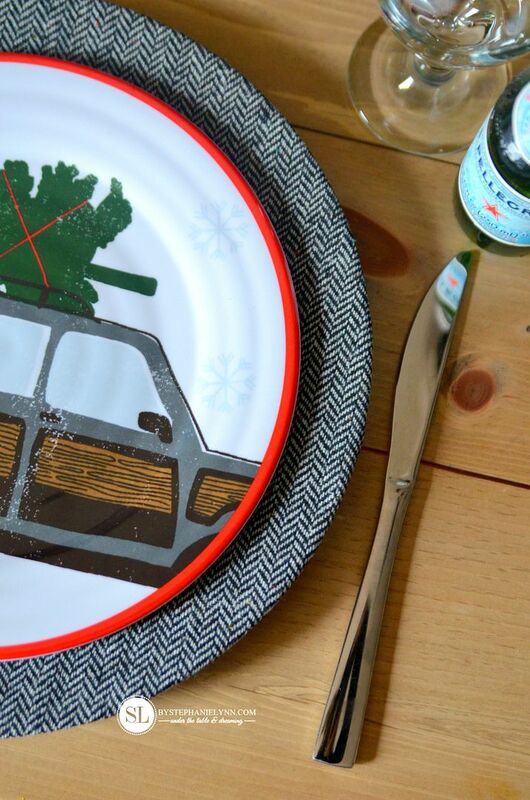 Underneath your adorable Christmas plates. I LOVE the chargers! Great idea! 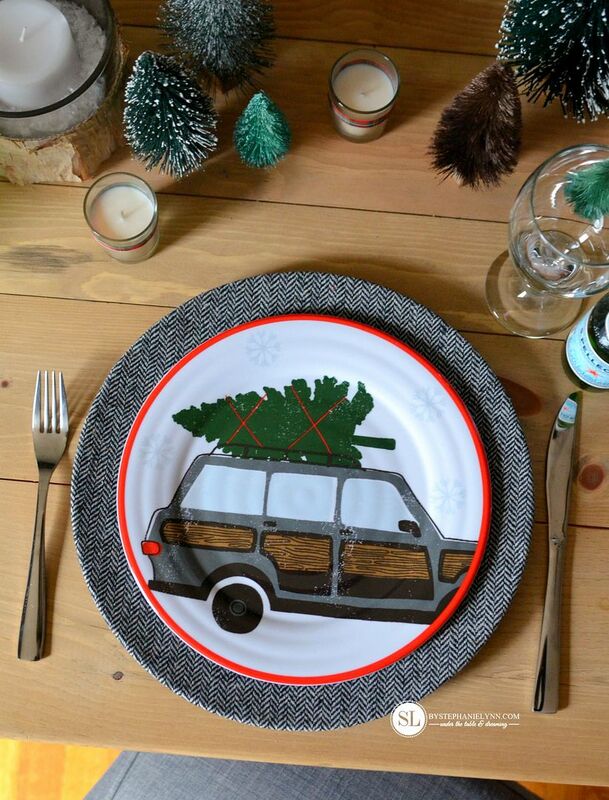 And the Station Wagon plates are too cute! Great job! Oh yea, I LOVE this. Everything. Great job, as is your norm, Stephanie. Merry Christmas! 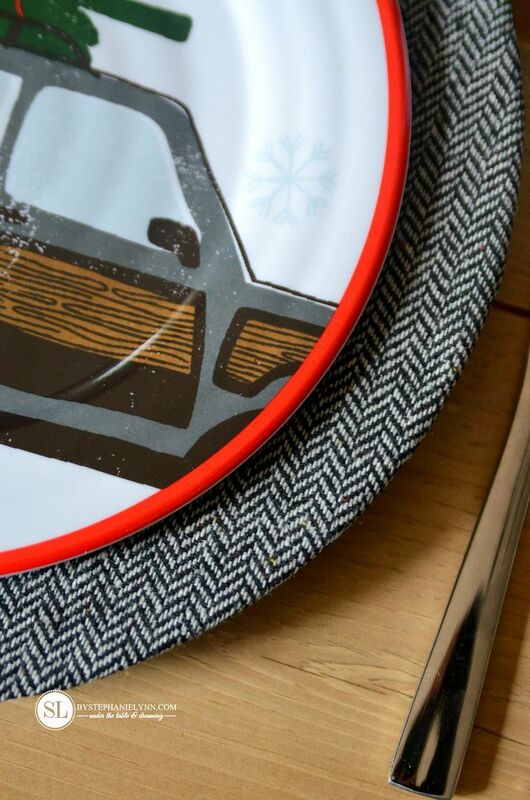 The charger plates are awesome! 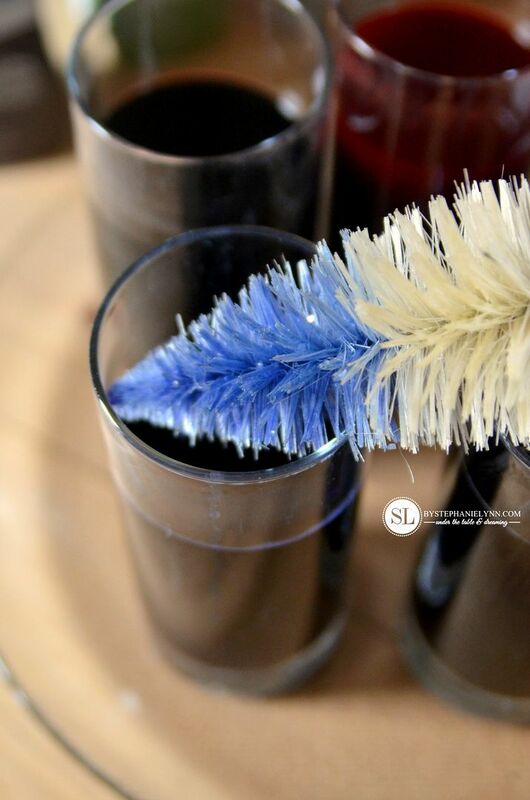 I wasn’t able to find chargers I liked for my holiday table, so I may have to find time to get supplies and do this project before my guests arrive next week!